Mr Alan Poh, Senior District Manager of SPAT DISTRICT of AIA. The Occassion is his 63rd Birthday on 16th Apr 2010. And also his 45th year with AIA. 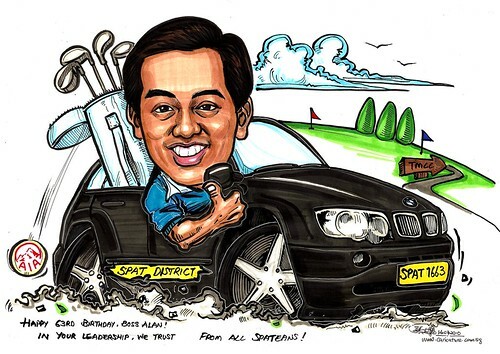 Possible background is he driving a limousine with the word SPAT DISTRICT printed on the vehicle. Possible car plate no, is SPAT 1663 ( 16th -63 years). In your Leadership we Trust." Proposed to change the limousine to BMW X5, as the former is too long. Graphically, it doesn't look that good, I think. The client is happy with my proposal of having the AIA logo on the drop-out golf ball, given that it was bought over by Prudential. "Thank you, Jit! It's beatifully done." "Hi Jit, Tks for the job well done for my boss Alan's present. He likes it very much. Probably u would receive enquiries about ur service fr many colleagues. Regards, Joe"